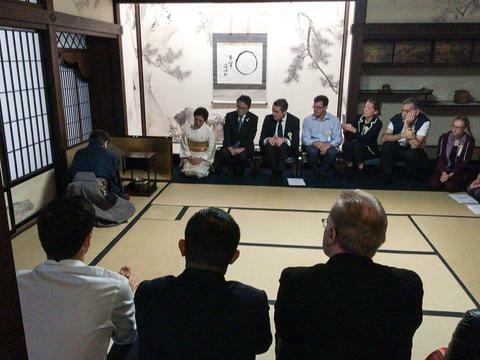 The rite of tea – aka Japanese tea-ceremony – is what I believe to be the core of Japanese tradition and culture. It combines a variety of arts and crafts, and brings them together in a coherent praxis that is the service of tea. Calligraphy, pottery, woodwork, architecture, and many more are at the basis of this praxis, but what is more is that the rite of tea expresses a true form of Japanese-ness. An adept in the art of tea, performing such a service, employs forms of bodily composure and movement that are authentic to this rite, and have come to be believed to be intrinsically Japanese. It is from this perspective that in modern Japan, the rite of tea has on many occasions served as a means to introduce Japanese culture to the world. An example of this is the international EXPO in Paris in 1937 where a Japanese pavilion was erected, holding tea ceremony demonstrations and geisha performances. As a high school student I was introduced to the diversity of Japanese culture through practice in Japanese fencing or Kendō. During my further studies on Japan I also attempted my hand at Karate and Jōdō (the way of the staff), and briefly practiced song and dance for Nō theatre. But it is the rite of tea that allowed me deepest insight in the background, meaning and philosophy of Japanese tradition. 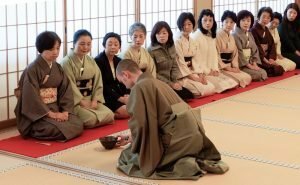 Starting in April this year, we opened a workshop for foreign visitors in Kyoto, offering a thorough introduction in the praxis of warrior tea. Most “tea-ceremony experiences” in the same city are either overly simplified and commercialised, or are presented with a lack of decent explanation in understandable English. We started our endeavours with the goal to relay a truthful and deep-going idea of what the rite of tea is to our guests, with understandable and educated explanations of the underlying ideas in comprehensible English. 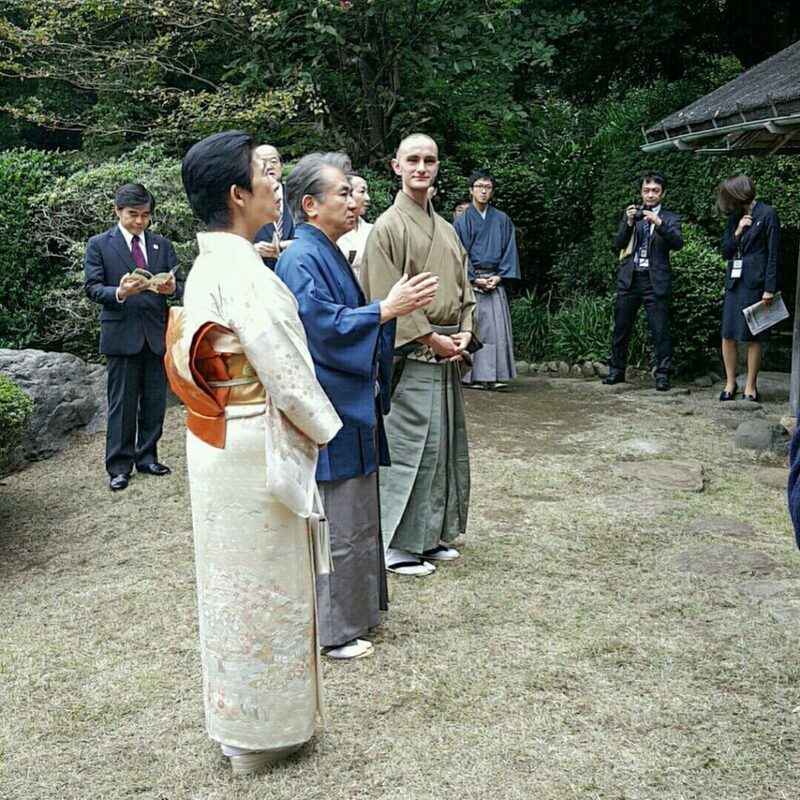 Left to right: Her Imperial Highness Princess Takamado (高円宮姫殿下), Kobori Sōjitsu Iemoto (小堀宗実家元), Tyas Sōsen (ティアス宗筅). We were invited by the Ministry of Education, Culture, Sports, Science and Technology (MEXT), and the Grandmaster to aid with the smooth progression of the service and to provide translation to our foreign audience from an educated insider point of understanding. Having learned the art for approximately 10 years, and Stephen Sōshun, my mentor and partner, currently for 25 years, we have gained insight in the intrinsic values of the rite, and also have a thorough understanding of what aspects of Japanese culture are easily understood or difficult to grasp from a foreigner point of view.Last Saturday, on October 22nd, we were enabled to further employ our expertise in Japanese culture and the rite of tea when the Grandmaster of our school, Kobori Sōjitsu Iemoto (小堀宗実家元) – head of the Enshū tradition of warrior tea (遠州流茶道) – hosted a tea-gathering for foreign officials and business leaders, participating in the World Forum on Sport and Culture, held in Kyoto and Tokyo. The gathering was held in the presence of Her Imperial Highness Princess Takamado (高円宮姫殿下) after a viewing of her personal exhibition of netsuke (根付) accessories, currently on display at Tokyo National Museum. We did not just literally translate. Conducting workshops for foreign visitors, and having learned the tradition from a foreigner point of view, enables us to learn from the questions and remarks our guests present us with about Japanese culture, and in effect enables us to form comprehensive answers and explanation to those questions. Some aspects that are culturally common sense in Japan, may leave a foreigner completely oblivious, and it are those aspects that require further attention. In our translation, we embedded that additional information, to allow our guests a deeper understanding of tea ceremony and Japanese culture as a whole.This knowledge is what I feel to be our foremost asset. 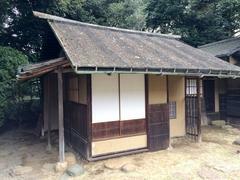 Before moving into the main building where the actual service was conducted, the group was led to a smaller tea pavilion called Tengō-an (転合庵), designed by the founder of the Enshū school, Kobori Enshū. Specific detail about this tea-hermitage will follow in a separate entry. Here the Grandmaster gave a brief lecture about the history of the hermitage and various aspects of what makes such a building specific to the rite of tea. It was my duty to provide translation into English. Later on, Stephen Sōshun took over and translated the Grandmaster’s lecture before and during the service of tea, while I assisted with carrying in bowls of tea and individually guiding guests in drinking procedures and related formalities. I believe that this skill, is a product of having resided in Japan for an extensive period of time, having engaged with a cultural practice that is as extensive as the rite of tea, and having worked with various foreign guests who allowed us the opportunity to develop a comprehensible and more educated way to explain what for most Japanese – and for us mostly as well – is perceived as common sense. Last Saturday’s gathering was an opportunity to re-evaluate our understanding of the rite of tea, and our ability to relay its meaning properly in English, taking the words from the Grandmaster and re-producing the essence into comprehensible English terms. The experience in itself was also highly satisfying to the extent that I wish to put more effort into introducing the beauty and depth of Japanese tradition internationally.